Julie is a trauma informed special education teacher, artist and community educator in St. Louis, MO. She's been working in Ferguson for nearly eight years in a variety of educational positions, but has been a Teacher of the Visually Impaired for nine years. In her time working in Ferguson and North County, as a Teacher of the Visually Impaired and within homes and schools, she noticed how high the instances of poverty, childhood trauma and overall toxic stress were among the families and students she served. After watching how deep the toxic stress was embedded into the daily lives of her students and their families throughout many years, she wanted to come up with a way to offer the gift of yoga that was culturally and physically acceptable to her students. Julie was passionate that yoga could provide students with healing tools that could empower them to seek healthy options of coping with toxic stress. Now in it's third year of existence, Fit Abilities continues to support students with visual impairments in North St. Louis County and beyond by teaching students yoga as a source of self-regulation and co-regulation. The support extends itself in day to day school routines, after school activities, and connects students' families to safe professionals that understand the impact trauma plays on them and their families. In the midst of creating the Fit Abilities Universally Yoga Program in the fall of 2015, Julie also helped create the St. Louis Trauma Informed Network (Integrate! ), after realizing there was a large need for professionals serving clients and students in communities with high amounts of trauma. The network allows its members to connect and share resources across transdisciplinary lines on a grass roots level. Additionally, the space aims to be a place to share resources and connect trauma survivors to appropriate professionals, aide in their healing, and connect professionals to each other to help support their caseload. Since the Fall of 2015, Julie has completed over 28 hours of continuing education hours of teaching trauma informed yoga to youth through Street Yoga and Yoga Ed. She is passionate about embedding trauma informed yoga practices into her daily professional practice as a special education teacher. Victoria Emanuela is a licensed professional counselor, mental health writer, meditation teacher, and trauma-informed community educator. She has extensive training in trauma informed mindfulness and is passionate about building complimentary healing resources for survivors, primarily womxn with complex trauma. One of her priorities is to make The Healing Arts practical and accessible in a way that merges the holistic insights and science behind their foundations, especially in current research. Victoria strongly believes that complementary healing modalities must fulfill a trauma-smart approach that are accessible, inclusive, and provide dynamic options for survivors. Victoria is the former owner/founder of Modern Healer Wellness Studio located in St. Louis, Missouri. She now lives in Oakland, California, where she’s expanding Integrate! Trauma-Informed Network’s platform, as a co-founder of the network. Victoria currently works with survivors of childhood trauma through workshops, trainings, and her private clientele. She is the co-founder of On Being in Your Body. Research Based Trauma-Informed Healing for INTEGRATE! 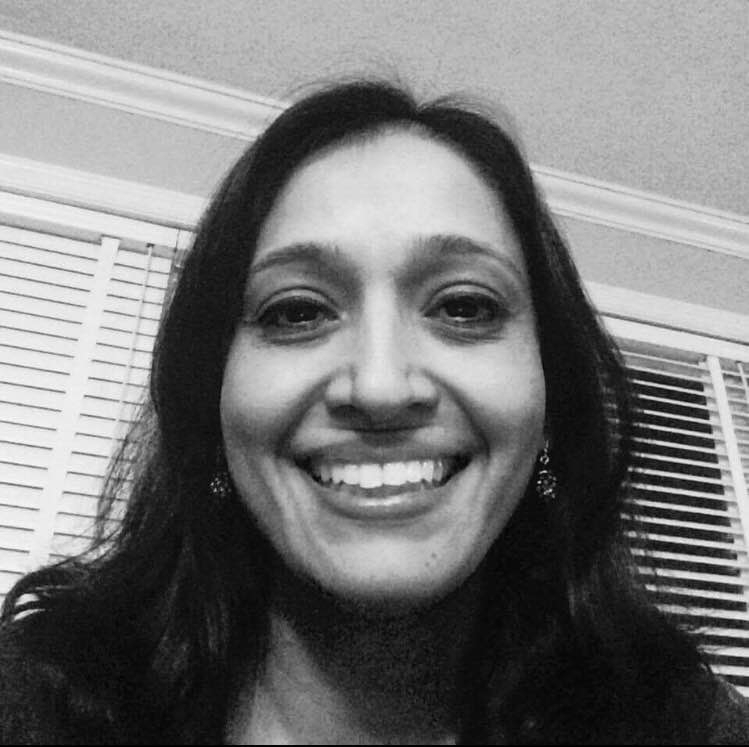 Anu is Fellowship trained and Board Certified in Pediatrics and Integrative Medicine, Anu has been in primary pediatric practice for twenty one years. With a special interest in trauma informed care for childhood mental health and obesity management, her integrative approach emphasizes the powerful triad of child-family-provider, makes use of all appropriate evidence based therapies addressing nutrition, sleep, behavior, mental health, environmental toxins, the mind-body connection, whole body healing systems, herbs, botanicals and supplements. She is passionate about building resilience for her family and her patients and creating and sharing resources though Lotus Creations where she offers her meditative music, healing art, children's book and global advocacy. She is grateful to empower all journeys, individual communal and global, towards wholeness and wellness. For more than 10 years, Candice Cox has provided licensed clinical counseling and consulting services to children and families in both the Rural Arkansas and Saint Louis Metropolitan Areas. Cox provides these services in a variety of settings including office, school, and in-home. In 2012, she began her own private practice, A&A Inspirations, psychotherapy services for children and families for individual and group settings. In 2014, Candice Cox founded KHAOS, Inc. (Keep Healing and Overcoming Struggles) program which works in schools and community centers to address the lack of social and emotional coping skills offered in home and community centers to address the lack of social and emotional coping skills offered in home and educational environments. She created a multifaceted curriculum with a student workbook and journal to assist youth and their families with processing their social and emotional development during and after each session. Cox vehemently believes in the power of helping and supporting people. She specializes her focus on children and families. She works tirelessly with community organizations such as Mers Goodwill, YWCA, Boys and Girls Club of Greater St. Louis, Ferguson Florissant, Hazelwood and Parkway School Districts, Saint Louis Public Schools, Provident ASAP Afterschool Program, and the Department of Mental Health, just to name a few. Civically, she is a member of the Brentwood and Northwest Chambers of Commerce, Ferguson 1000, Business Women Connecting, SisterKeeperSTL, and the St. Louis Metropolitan Chapter of Delta Sigma Theta Sorority, Inc. Recognizing that conflict, communication, and parenting struggles can feel overwhelming without adequate support, Cox provides comprehensive client-centered interventions. Cox uses innovative, experiential and strength-based treatment modalities to change the focus from being labeled to living beyond labels. As a published author, Cox’s book Please Oh Please Be Patient With Me serves as an outline to help children who struggle with ADHD in school and at home. Her goal with every client that she encounters is to facilitate their full empowerment and self-sufficiency, as only they are the experts of their lives. Cox tries earnestly to be a catalyst in the lives of others to propel and keep them moving forward through her clinical work and as a national speaker and trainer. Her motto is, life happens but that doesn't mean it has to stop as we all have the ability to Keep Healing And Overcoming Struggles. As a native of St. Louis, Meghan Jendusa has spent years learning about and working to reduce the economic and social disparities that exist in urban communities. She worked with urban youth in St. Louis Public Schools and University City school district for three years, in early education classrooms and at the administrative level, where she helped with the initial implementation and management of the Missouri A+ Program at SLPS. Following her undergraduate studies Meghan participated in the Coro Fellows Program in Public Affairs where she worked for a number of agencies in the St. Louis community including Great Circle, the City of Brentwood, U.S. Bancorp Community Development Corporation, and the St. Louis Regional Health Commission, where she helped to found Alive and Well STL. Following the Coro Fellows Program she continued her education in public policy at the graduate level, then returned to St. Louis to develop a local initiative to reduce disproportionate minority contact in the 22nd Circuit Court, Juvenile Division. Meghan manages a pilot school program entitled, Closing the School to Prison Pipeline: Shut it Down, where she supports educators at seven SLPS elementary schools learn about the intersections of race, bias, and trauma in our education system, as well as build skills and strategies for supporting minority students succeed. Meghan is a 2012 graduate of Saint Louis University where she earned a B.A. in Urban Affairs and Political Science. She holds a Masters of Science in Public Policy and Management from Carnegie Mellon University. Carrie Burnett is a licensed massage therapist who is training with the Somatic Experiencing Trauma Institute to become a somatic experiencing practitioner. In her practice in St. Louis, Carrie utilizes a variety of different massage and body work techniques within a trauma-informed mindset to facilitate and encourage the healing potential within the mind and body of trauma victims. When there is trauma, the body often holds some of our stories, but it will also tell these stories if we can learn to listen; this is one of the main objectives of Carrie’s practice. Natalie Coriell is a trauma-informed Licensed Counselor (LPC) and board certified Art Therapist (ATR-BC) as well as an EMDR trained therapist. Natalie runs a private practice, Connecting The Dots, that focuses on teens and young adults. Natalie specializes in group and individual therapy with at-risk youth. Natalie is active in community arts and believes in the power of community for teens to grow through traumas of life and thrive as they move forward. Reita Johnston is an Attainment Coach, Reiki Practitioner and the founder of Power House Coaching. She’s a Maryland native living out her dream of raising her family in Seattle and exploring the world on her terms. Her passion, life purpose and the mission of Power House Coaching is to empower others to reconnect and heal themselves, awaken their full potential, rewrite their stories and as a result create a life they’re passionate about. Reita has certifications in Transformational Life Coaching, Reiki, has studied Neuro-Linguistic Programming, Chakra Balancing and studied Energy Work and Cherokee Native Healing Traditions since 2015 under a Native Elder, spiritual counselor and visionary artist. Sher Nicholson, a City of St. Louis native, is currently a Social Worker turned Yoga Instructor. With over 10 years direct-care experience within various Missouri juvenile detention centers working with at-risk youth and their parents—her passion is still in helping people. She currently teaches yoga/mindfulness within various St. Louis Public and private school sectors. Sher believes in the power of self! You will truly be amazed at what you can do for yourself; you just have to just believe you can do it and try! That's why Sher believes self-care is the best routine for the course of life. Sign up for our monthly newsletter with great trauma-informed resources, inspiration, and giveaways!